Plastic is an insulator. Aluminum die cast parts are electrically conductive benefitting manufacturers. Plastic needs a special coating or needs to be impregnated with metal particles to achieve a similar but inferior result. Plastic does not ground. Metal enclosures and housings are easily grounded. Plastic needs additional grounding "metal" straps. Plastic does not block RF. Aluminum Die Cast Enclosures are a natural shield for RF and EMI. They help prevent radio frequency. Plastic Injection Moldings are weaker than aluminum parts. Compared with plastic injection moldings, die castings are stronger. Plastic Injection Moldings are too flexible for many applications. Die Cast Aluminum parts are more stiffer. Plastic Parts are not very dimensionally stable. Aluminum parts are more stable dimensionally. Plastic injection molded parts do not generally do well in hot conditions. Aluminum is more heat resistant. Plastic does not fare well with many coatings. Aluminum parts are far superior to plastics on a properties/coat basis. Plastic injection molding does not block radio frequency. Plastic does not block electromagnetic emissions. Plastic injection molded parts do not lend themselves easily for chrome plating. Die castings have a high degree permanence under load compared to plastics. 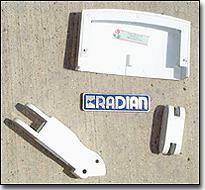 Die Cast Parts are completely resistant to ultra-violet rays. Die Cast Parts are completely resistant to weathering. Die Cast Parts are completely resistant to stress-cracking in the presence of various reagents. Manufacturing cycles for producing die castings are much faster than for injection moldings. The non-metallic portion of a product is generally regarded by recyclers as "fluff," consisting mostly of plastic. Nearly one-quarter of all solid waste is estimated to be plastic, and less than 3% of this plastic is being recycled. Problems with plastic product recyclability were brought up by a national task force, which requested that plastics marketers refrain from using the universal symbol for recycling in advertisements, since it was regarded as misleading in relation to plastics. Nearly all metals ? and die castings in particular ? have always been readily recyclable. Die castings are not hazardous waste and pose no problems in handling or reprocessing, as do some toxic non-metallics. Net-shape die castings can be produced with thinner walls than comparable plastic parts, and can provide greater strength and product durability over a longer life cycle ? with added serviceability. Die Castings Recycling Circle -Aluminum die casting alloy recycling has been in place almost from the beginning of custom die casting production. Over 95% of the aluminum die castings produced in North America are made of post-consumer recycled aluminum. Since the production of recycled aluminum alloy requires approximately 5% as much energy as primary aluminum production, there is a dramatic conservation of non-renewable energy resources.